It's baaaaack! The 2nd installment of the B1G Coaches Hot Seat 2011 edition. You can read the Legends division post here. The Legends division sees 3 new coaches this year, and some relatively safe bets with Ferentz, Dantonio and Fitzgerald. But the Leaders division is not going to be so safe. There are some really ugly coaching situations here, and that is why the Legends went first. Save the ugliest division for last. How do you do it, Ron? I'll just say it now, I don't know how Ron Zook is still employed at Illinois. Last year we said he was a dead man walking. He went 7-6 overall and 4-4 in the B1G. He lost to Mizzou, tOSU, Sparty, Michigan (3OT), Minnesota and Fresno State. He beat Penn State and then Baylor in the Texas Bowl. That's the extent of his impressive wins last year. That win in the Texas Bowl probably saved Zook. Or at least bought him another year. His contract ends in 2014. As far as what Zook has to work with coming back, he only has 6 starters coming back in defense...the same defense that gave up 67 points to Michigan last year. Actually, other than that game, Illinois wasn't that bad on defense. Not great, but not bad. Much of the front 7 are gone, but the secondary will be pretty good. He must also replace leading rusher Mikel Leshoure, who racked up 1,600 yards rushing last year. But returning QB Nathan Scheelhaase (who's name I hate to type) could have a nice year. But never underestimate the importance of replacing a great punter...and that's what Anthony Sentella was last year. 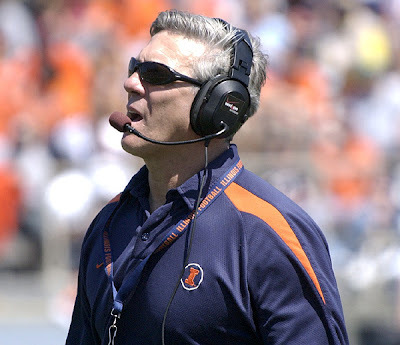 I suspect a carbon-copy of 2010 for Zook and Illini. If they can get to 7-8 wins...or 6 wins and back into a whocares.com bowl, then Zook will likely be safe. Their schedule sets them up for exactly that. Probably 3 non-conference wins and 3 or 4 B1G wins. I'm just going to say this now, watch out for Indiana. Not this year. Probably not next year, but soon. 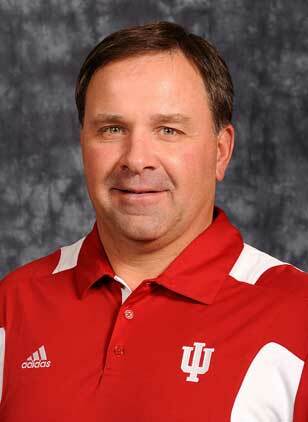 Indiana hit it out of the park with this hire. Wilson was a big reason why Oklahoma was so good for the last nine years, as their OC from 2006-2010, and as co-OC and OL coach from 2002-2005. It was just a matter of time for Bill Lynch. He needed to put together a bowl team like he did in 09...and he just didn't have the players. He had Ben Chappell...who was good. But that was about it. Let's face it, you can't get away with playing Towson every week. A solid 7 starters on offense and 6 on defense will give Wilson a base to build off of. Most of the OL and both kickers come back as well. The schedule will test the new coach once the B1G games start, as it should. I suspect more than 1 B1G win, which is all they got in 2010. But this season will be a struggle. Wow. What a difference a year makes. Last year, he was by far the safest B1G coach. He and his $3.8 million dollar contract were the class of the league. He has amassed as insanely impressive coaching resume in Columbus. Even amid all of the uncertainty and ugliness around his program right now, there are still many who think that it will be Tressel's "senator" image and his on-the-field success that will save him from losing his job. But even as I write this, there is no way to know for sure if he'll be on the sideline this coming season. All signs point to yes. After he sits out his 5-game suspension, it is assumed that he'll be back in the saddle. I think it will take a swift NCAA ruling, or more ugly headlines like the ones that are just coming out now about some tOSU players are/were getting free used cars that will ultimately force Sir Teflon to fall on his own sword. But make no mistake, Tressel is a very proud guy who takes his image very seriously...it will take a lot for him to step down on his own. So for the sake of doing this, let's just say he does come back after his suspension and coaches the last 7 games of the season. I'm assuming tOSU still does pretty well...possibly still contending for a league championship...probably going to a BCS bowl. 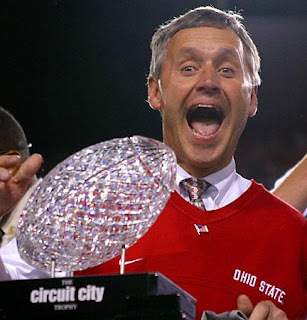 When the NCAA finally gets around to deciding tOSU's/Tressel's fate (which will likely be bad), I don't see any way that Tressel is the coach in 2012. He's simply going to be way to toxic at that point. Plus, all of the bucknuts will be calling for Urban Meyer to step in by that point anyway, most won't even care that Tressel is gone. Some are already of that mindset in Columbus. *No coach has ever gone from one end of the scale to the other in one season. Are These Michigan's Throwback Jerseys?